So we have decided to start sharing what we have learned (in a lot of cases, the hard way) with others. No secrets. If I have a bad experience with something I will share it and at the same time I will offer when I am at fault with my approach or use. On the flip side I will share info on the products that work for us along with their Pros and Cons. So what is the “RAW” Deal? Well, I wanted to pull together a couple of tests to visually show why, as professionals, shooting RAW is so important to us. Especially as Theater Photographers, it is an absolute necessity. I can’t begin to tell you how much variation in exposure and color temp we deal with within just one frame, never mind the 1500 or so we typically come back with from a dress rehearsal. The RAW file allows us the maximum adjustment potential from of each image. With memory chips getting larger and cheaper, computers and cameras getting faster and faster, a lot of the old “drawbacks” to shooting RAW are rapidly fading away. 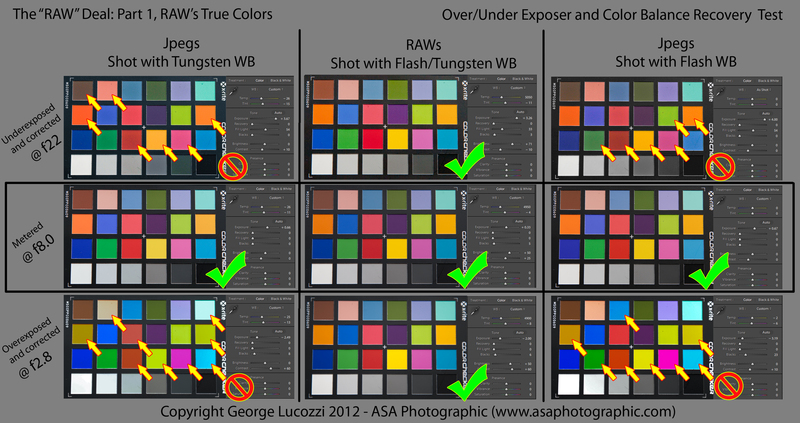 Add to this that Lightroom 4 is knocking on the door and, to me, it's a no brainer. Lightroom 4 will bring the ability to locally adjust images with unlimited variations of color balance, exposure, noise, sharpness…this is nothing short of MIND BLOWING. I have been personally waiting for this one for a while and I can’t wait!! This was made to truly exploit the RAW file’s power. So what is it that you are looking at here? Well, in short, I set-up a Color Checker card at the studio with a one light set-up. I metered the exposure to f8 then using RAW and JPEG formats captured the scene as metered. I also under and over exposed by a stop and a half using both Tungsten and Flash White Balance. Each over/under exposed image was pulled into Lightroom using all the same settings and corrected visually using the white balance tool and ONLY the basic adjustment panel. I glued them all together in Photoshop and put the screen shots of just the develop panel adjacent to each so that you can get some idea of what I had to do to obtain these results. When you capture an image, a large amount of light data is collected by the camera's sensor. The JPEG is the resulting compressed image file you get from the camera AFTER the data it is processed (developed) based on the settings you have plugged into your camera. All the data that it doesn't need based on the settings you chose (color balance, contrast, sharpness, luminance, exposure) is discarded. 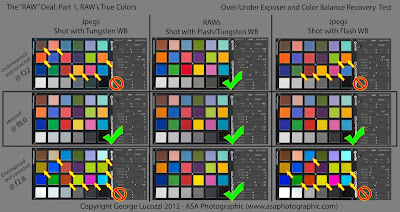 So, when you are shooting, if you don’t have all your settings nailed in camera or maybe you have a mix of color balances and varying exposures across a scene, you are already at a loss before you even get started. As compressed files, JPEGs start to lose the quality of the original capture the second you take the image and continue to do so as you process them in any way. The advent of Lightroom and Non-Destructive editing has helped pull the reigns back on this situation to some extent, but your editing flexibility will always be limited by the data you are left with after the camera’s processor has dumped the information it deemed unnecessary. RAW files send ALL the data originally collected from the sensor directly to the file and circumvent the processor thus maintaining the maximum amount of image data and post-processing power. Another nice benefit to RAW, you can forget about having to nail the color balance on location. Just shoot a color checker (as you always should) for a post processing reference. When you're shooting pick a setting that is close, lock it in and concentrate on getting the rest of it the way you want. The old way of thinking, “I am a good photographer, I don’t need to shoot RAW!” is at the very least (and in my humble opinion) a naive and uneducated attitude. The fact is that no matter how good you are, within any one image you can have multiple sources of light (with a mix of White Balances) across varying exposures of light to dark. Looking at these test results, think about the fact that these images where taken in a controlled environment with the lighting, exposure and white balance already nailed. Look at the variations there and then think about how often do you get this much control in the field? When you take all the other factors out of the equation, on some levels, the RAW file helps separate the Pro’s from the amateur shooters who everyday have more and more power in their hands. For those of us that obsess over quality and range in an image, the RAW file gives us that power to excel that not just anyone is going to invest the time and money into having or learning. Ansel Adams spent hours and even days in the darkroom to get the final print, pulling off what we can do on screen in just minutes with one RAW exposure and some post processing. Just think about how jealous he would be at the power we now posses. Why not just switch back and forth based on the job? Switching your file format back and forth based on what you are shooting, at least in my experience, has proven more harmful then good. I have found it is just easier to leave the camera on RAW and forget about it. What inevitably ends up happening, sooner or later, is that in a rush to set-up your camera for a shoot, you will leave the camera on one setting when you wanted or needed the other. Not such a big deal if you accidentally shoot a RAW file but if you intended to have a RAW and shot a JPEG, that might be a problem! It happened to me once and my mind being so hell bent when it comes to shooting RAW, I actually felt about as sick as if I accidentally deleted the images. Sounds extreme, but that’s how I felt. Again shooting theater, I knew it was going to be a rough ride in post-production. Q: So when do we shoot JPEG? A: We only shoot JPEGs in our point and shoot for personal family photos. Q: When do we shoot RAW? -Middle images were metered and taken at 1/125s @ f8, ISO 200. -The center column of RAW images was shot in both Flash and Tungsten. Showing both was irrelevant as once color corrected they looked exactly identical throughout the test range. -Each over/under exposed image was then adjusted for color balance first using the LR dropper tool targeting the medium gray patch on the color checker card, then using on the basic development sliders adjusted by eye in efforts to achieve an image that most closely replicates the image taken at the metered exposure. Hi Gail and George, Yes RAW rules! I usually shoot both, mostly so I can use the lower res jpeg as quick proofs. And yet the much maligned jpeg is still a pretty awesome format given it's convenience and memory saving qualities. But yes it still is an "interpretation" that limits our options. Also, you reinforce the idea that there is an optimum exposure that we should still be trying to achieve, as it gives us the advantage of starting out with good color and densities that can speed our workflow. Thanks for sharing! Thanks Jim! Yea, Gail made sure we stated that. By no means is the RAW files purpose to allow us to be sloppy with our shooting. It allows for dynamic images to be porcessed and rendered more accurately then ever before imaginged! "Tales of the Traveling Tattoos"